In January 2009 I moved from Leipzig to Hannover. 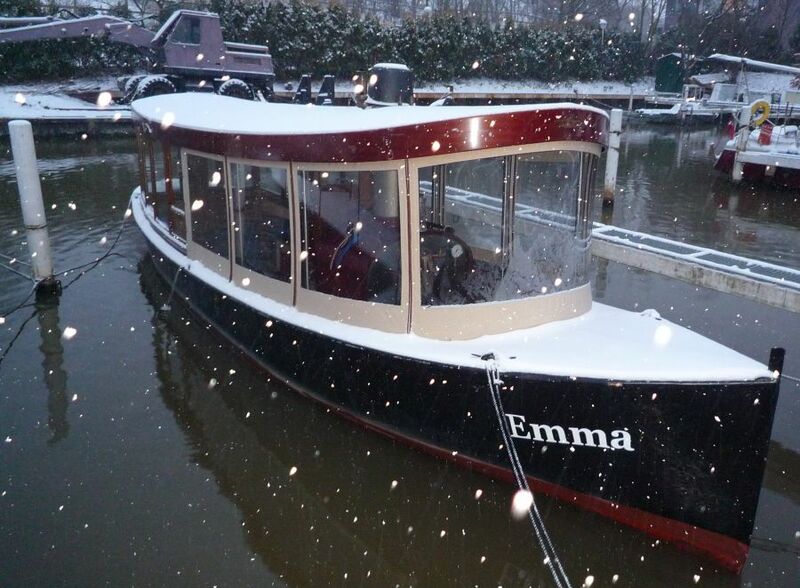 In the Summer 2009 I also brought Emma from Berlin to Hannover on a 300 km steam boat trip in 3 days. 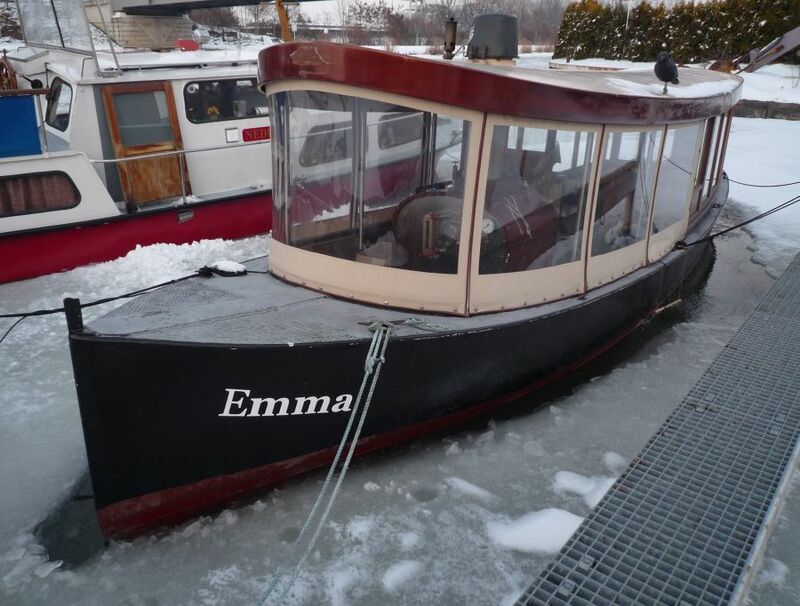 As in Berlin everybody here told me that the "Mittellandkanal" will not freeze hard in winter and it will be no trouble to let Emma in the harbor - so I payed the rent for the winter season 2009 /2010. Now I had the big advantage to live only 10 minutes by car from the harbor to take care of Emma. But this year we got snow, snow, snow - a lot of it. So Emma got a high head which I had to remove several times. In the first days the thermal capacity of the water plus the heat from the canal bed was enough to keep the water ice free - this picture was taken at the 4th of January 2010. But after a while the ice creped near Emma's hull and I have to shop the ice around her twice a day - before and after my work. 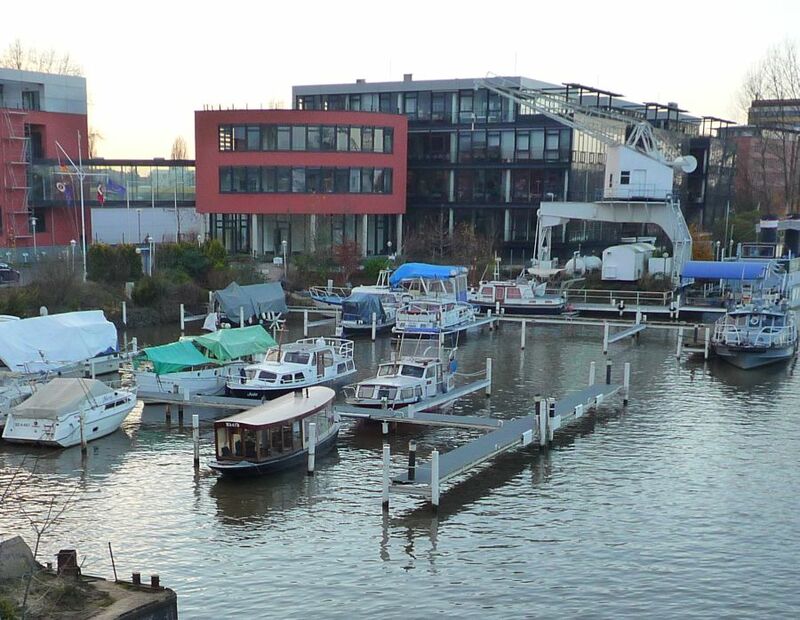 Even the commercial traffic on this highly frequented canal from the "Ruhrgebiet" to Berlin and Poland was stopped for more then two weeks - a seldom situation in the Lower Saxony area. While Emma was slightly warmed by the river stream in my Berlin Winter "Storage" in 2008/2009, now in this canal no stream helped her. 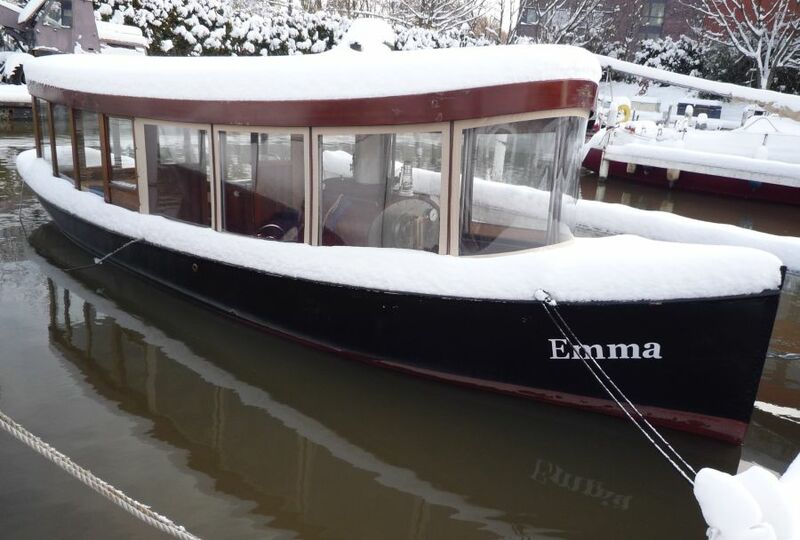 The ice creped down the iron hull of Emma. 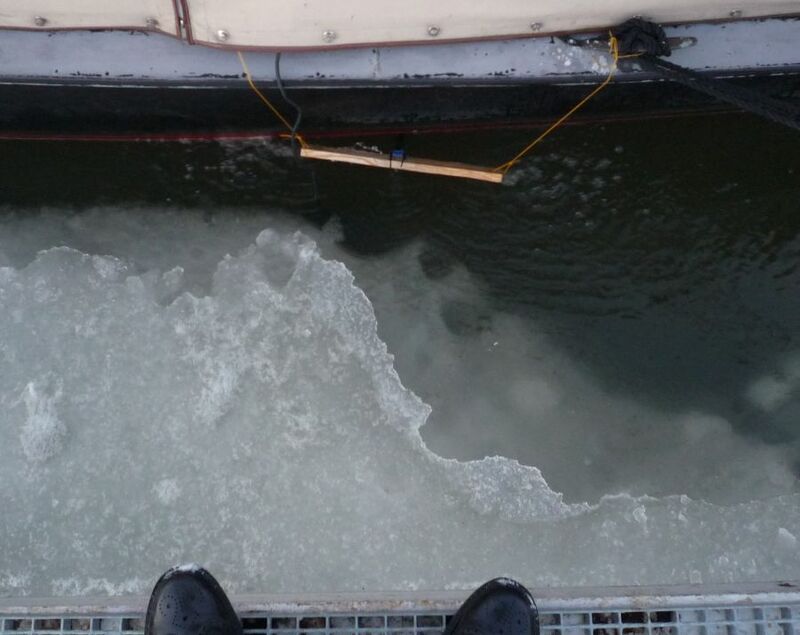 Here the ice had a thickness of about 20 to 25 cm (10 inch) while the ice in the rest of the harbor was only about 10 cm thick. 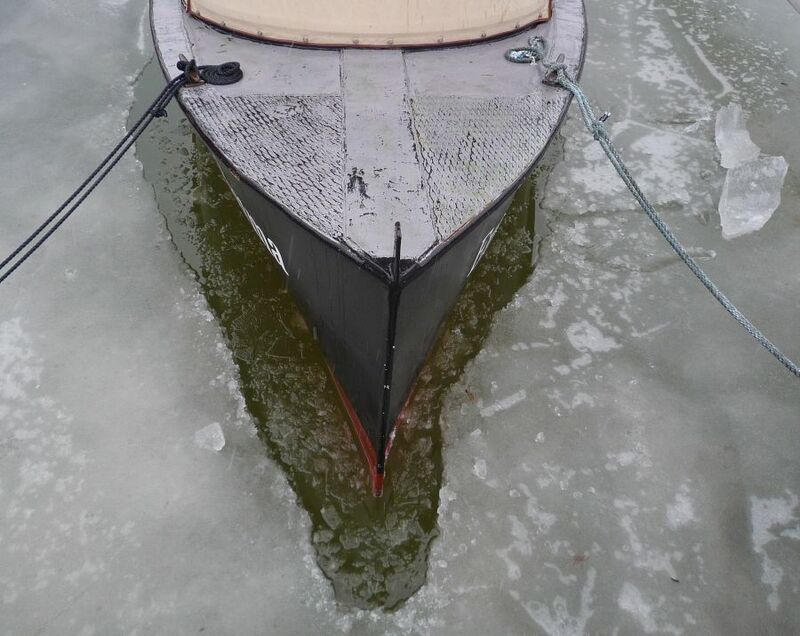 When the ice breaker or the coal barges for the power plants passed the harbor, the ice sheet went up and down. When two barges passed right in the front of the harbor it could go down more then 60 cm for a while. At the end of January the temperatures still went deeper then -10°C frequently. So I decided to simulate the water stream from Berlin here in Hannover. Firstly everybody told me I had to install tubes for an air stream at the ground to move the water. But then I bought two small cheap fountain pumps with integrated filters and mounted them at each side of Emma. The smallish water stream kept her from the ice without any additional actions while all other ships in the harbor where captivated by nature. Here you can see the simple over water installation with a wooden support and a T-coupling for the two nozels. The pump with it's integrated filter sits about 1 meter under the water surface in the warm water. 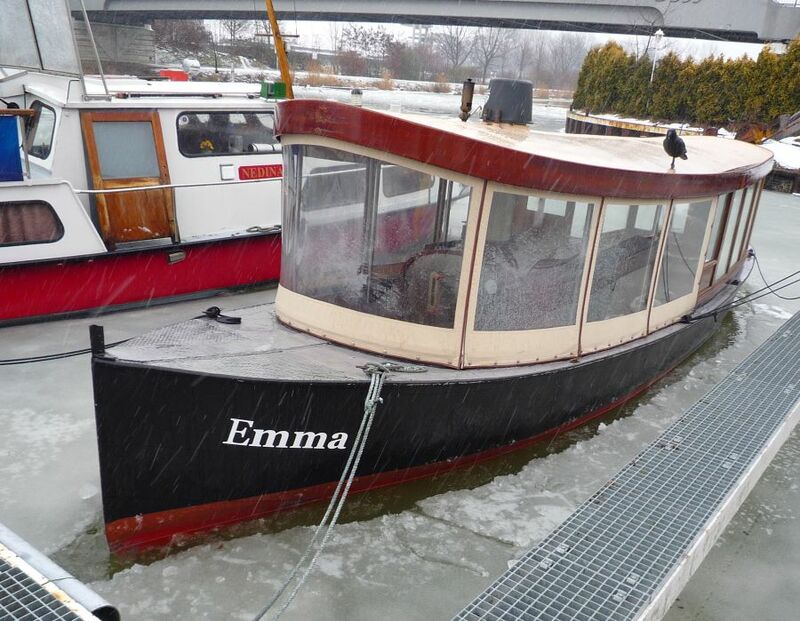 Emma withstands this winter period without any trouble - only some paint was gone by the ice contact.